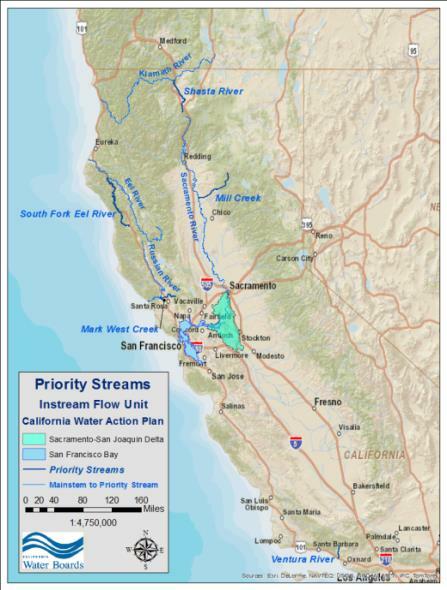 The California Natural Resources Agency, the California Environmental Protection Agency, and the California Department of Food and Agriculture developed the California Water Action Plan (WAP), which was signed by Governor Edmund G. Brown Jr. and released to the public on January 22, 2014. The WAP has been developed to meet three broad objectives: 1) more reliable water supplies; 2) the restoration of important species and habitat; and 3) a more resilient, sustainably managed water resources system (water supply, water quality, flood protection, and environment) that can better withstand inevitable and unforeseen pressures in the coming decades. Over the next five years, the WAP actions will move California toward more sustainable water management by providing a more reliable water supply for California’s farms and communities, restoring important wildlife habitat and species, and helping the state’s water systems and environment become more resilient. The State Water Board and CDFW are currently working to identify potential actions that may be taken to enhance and establish instream flow for anadromous fish in these five priority streams. As these actions are identified, additional information will be added to this website. California's large size and diverse topography result in many unique habitats in which an unusually high number of genetically and ecologically distinct groups of anadromous fish have emerged. Anadromous fish refers to fish that are born in freshwater, then migrate to the ocean for feeding and growth, and finally return to freshwater to spawn. Commonly known anadromous fish include salmon, steelhead trout, and sturgeon. The streams identified for the WAP effort are primarily coastal streams where the survival of salmon and steelhead (together referred to as salmonids) are of particular concern. Of the 22 distinct groups of anadromous salmon and steelhead in California, 13 (59%) are in danger of extinction and are in need of enhanced protection. Historically, salmonid populations such as coho salmon, Chinook salmon, and steelhead trout were abundant and widely distributed throughout California's Central Valley and coastal rivers and streams. However, many of California’s streams that once had thriving salmonid populations now have populations at or near historic lows. Many studies attribute the decline in salmonid populations to insufficient and poorly timed flows for fish during key life stages, such as spawning and rearing, declining water quality, barriers to migration (e.g., dams or other structures), and decreases in floodplain and riverine habitat connectivity. Competing uses of water and increased water demand have resulted in degraded watersheds throughout California. Although significant progress has been made toward improving water quality, relatively little progress has been made toward rehabilitating degraded instream and riparian habitats resulting from past and ongoing stream modifications and continued insufficient flow. As a result, many streams do not have flow regimes or habitats that support healthy fish and wildlife populations. Flow enhancement efforts are intended to increase and improve aquatic habitat quantity and quality in priority stream systems in California. As water demand for all uses continues to grow throughout California, it is important to establish flows in critical stream systems to protect native aquatic life. Adequate stream flows are necessary to ensure: 1) fish passage for adult upstream migration and juvenile out migration; 2) stream connectivity, including sufficient water for side channels, backwater areas, and/or floodplains to support feeding and rearing habitats; 3) aquatic benthic macroinvertebrate production as food for salmonids; 4) good water quality and temperature, both of which are influenced by the quantity of flow; and 5) the maintenance of aquatic ecosystem processes (e.g., nutrient and energy cycling). State Water Board staff recognizes that there are many ongoing or planned flow enhancement efforts by a variety of stakeholders. The State Water Board is interested in collaborating with all stakeholders to achieve the goals identified in the WAP, and encourages ongoing communication throughout this effort. As specific flow enhancement and coordination opportunities are identified, additional information will be added to this website. Russian River Tributaries Emergency Regulation Follow-Up Outreach Meeting Notice- State Water Board staff held an outreach meeting on August 28, 2017 in Santa Rosa to present information and results obtained under Order WR 2015-0026-DWR: Order for Additional Information in the Matter of Diversion of Water from Dutch Bill Creek, Green Valley Creek, Portions of Mark West Creek, and Mill Creek Watersheds. State Water Board and California Department of Fish and Wildlife (CDFW) staff hosted two Russian River Watershed Outreach Workshops – on December 17, 2015 & January 26, 2016, in Santa Rosa. Study plans for the Shasta and Scott Rivers have been developed by Normandeau Associates, Inc., under a contract with the California Department of Fish and Wildlife. There are additional flow related efforts occurring by the agencies listed in the section below.